Decorate your home and garden! 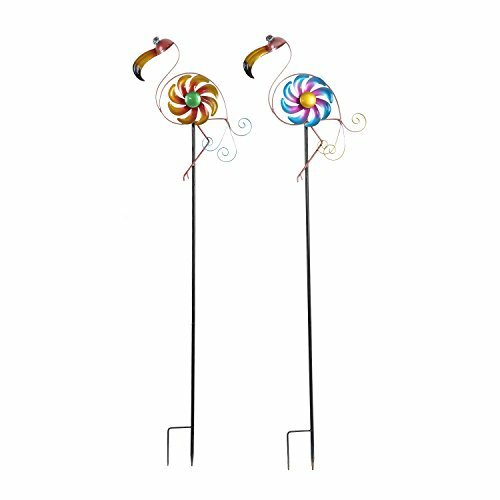 CEDAR HOME wind spinner twirler sculpture garden stake, constructed of heavy and sturdy powder coated metal. Beautiful antique-style rooster and flamingo finish. After easy assembly, the garden spinner is 49.5 inches in height. The ornamental spinner is 11.5/10.75 inches in width. The Designer wind spinner adds an eye-catching addition to your garden. It also offers a delightful way to greet guests on the front porch, to bring extra sparkle near a water feature, or to add a splash of color and character out on back yard. Bring color and charm to your outdoor setting with the unique Rooster and Flamingo Wind Spinner.